We are currently working towards the switch from the old website to the new one, so many of the recent developments relate to making the new website easier to navigate. After receiving feedback, we have made some changes to the website, including the option for content editors to change the website header image at any point. We are currently featuring an image of Bramall Hall to reflect its recent re-opening. We’ve also worked on caching validation, which means that when we make any changes to the website pages, they will become live much more quickly. The Style Guide has been updated, with a defined colour pattern which can be adapted to affiliated websites. More content has been made available on the new website and this is now displayed under a subtopic view. When a user clicks on a topic the top six most important subtopics are now displayed underneath. 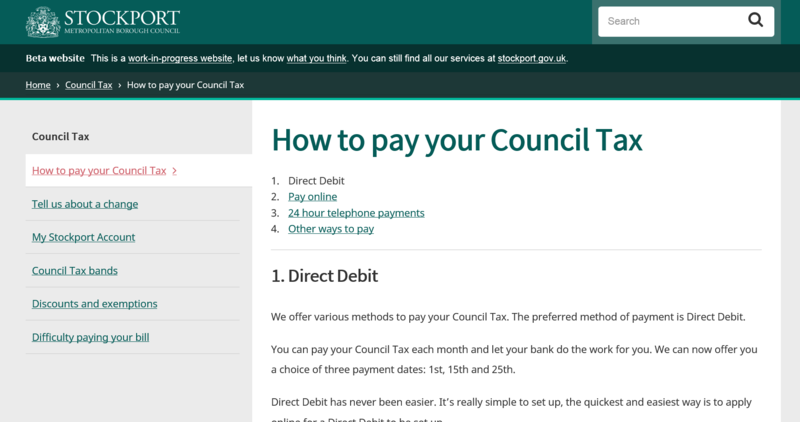 For example, clicking on ‘Council Tax’, offers sub-menu options ‘How to pay your Council Tax’, ‘Tell us about a change’, ‘My Stockport Account’, etc. Sidebar navigation has been added, which gives users the option to navigate to other articles instead of having to go back and forward to the pages. This way, users can see much more on the website without having to navigate into different topics to find the content that it’s relevant to them. A postcode search option called ‘My Area’ has also been added to the bottom of the homepage. We are adding much more content to the website, including Leisure, Parks & Outdoor, and Parking. The content will be made live once it has been fully approved. Upcoming features include email subscription for newsletters and a new newsroom. 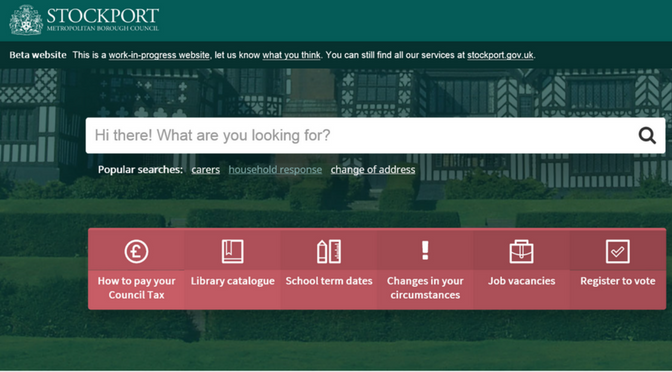 The next major step is to make the new website independent, meaning the beta site would no longer be the beta site but would be accessed directly from www.stockport.gov.uk. We will reach this point once all the frequently used content and the majority of content in general has been added to the new site. BI has made good progress by continuing to enrich the data warehouse with different groups of data. We are mainly concentrating on extracting and transporting the Children’s Social Care data and transforming it into a good reportable state. We’ve also been extracting and transporting data from the Contact Centre, such as web chat, phone calls and CRM into a Customer Contact Dashboard, which will give us real-time data and insight into demand and activity across multiple channels. 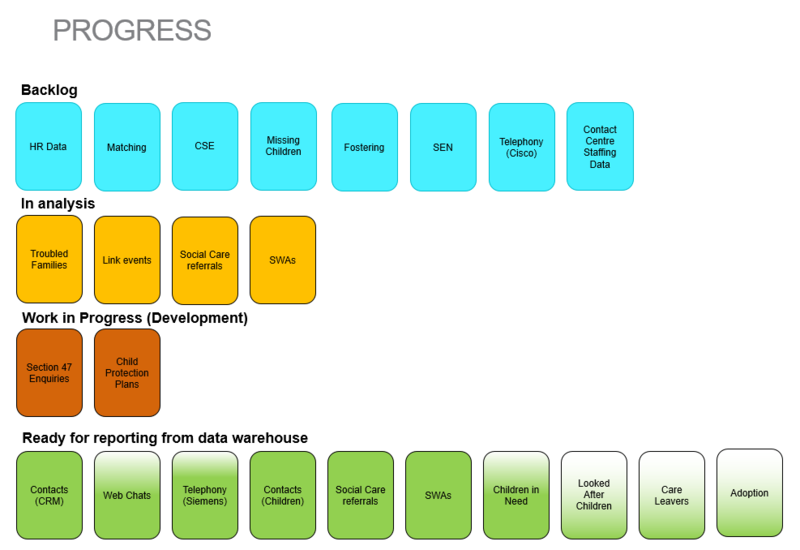 Upcoming work will focus on channel shift / Digital Transactional Services, Contact Centre Dashboards (adding more data), a new Children’s Social Care dashboard, data quality improvement and staff development (introducing staff to the data warehouse and new technology, so they can get reports from one source instead of multiple ones). User testing of My Account with members of the public has been done for the first time. We have initially tested the most important user journeys, which are: creating an account, making Council Tax payments and viewing bin collection dates. The great news that came out of the user testing was that we had 100% task completion, which validates the design and the decisions we’ve made in terms of the user journeys. 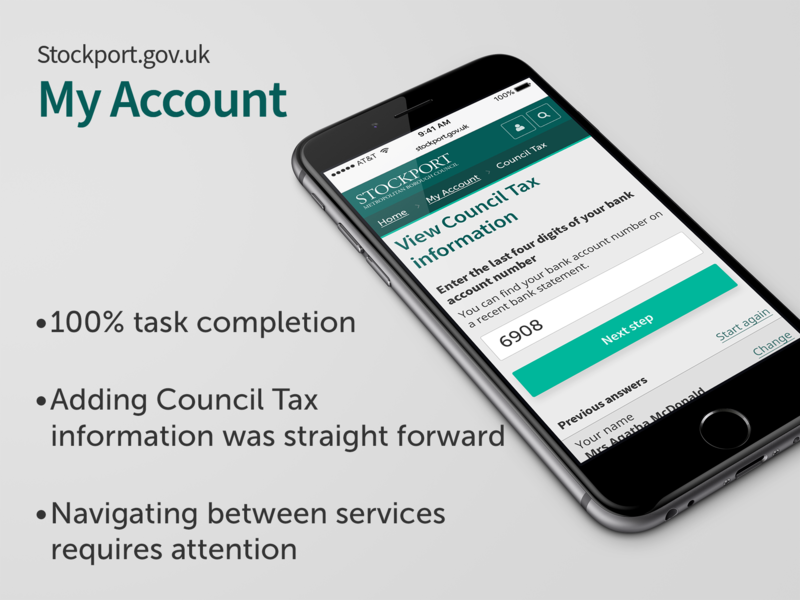 People also found that adding Council Tax information was a straightforward process. However, there were some issues that users picked up, such as navigating between services. After inputting their Council Tax information, users weren’t sure how to get back to the main dashboard. This is valuable feedback for us and will enable us to make the necessary changes. Feedback was also received on the colour coded Transaction history page which some users found confusing, so we’ll also be making changes to this.